Here’s another oddball car I’d one day like to have – a Jensen Healey. One of my father’s colleague/friends had one of these in white with 1970s-style black Jensen-Healey lettering above the rockers (his other car was an International Scout… cool). While that was not my first sportscar experience (that “honor” went to a dark blue C3 Corvette one of my parents’ friends owned), I think it was my first ride in a European open-top car. At the time, I had no idea what the engine was about in these cars, but it’s now one of the reasons I’m fascinated with this – the Lotus 907 16 valve twincam four with 140hp, also used in the Esprit, Elite, and Eclat. Apparently most of the early reliability woes have been overcome with this engine, and if you’re feeling spendy, you can also do several upgrades that will give you another 40-50hp without spoiling driveability. 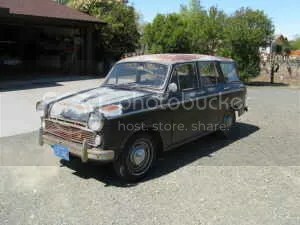 Here’s a car that closer fits the oddball category than some of the other cars I’ve featured recently – a 1962 Datsun Bluebird 312 Station Wagon for $2650 in Calistoga, CA. I know, generally Japanese cars and oddball don’t go that well together. But they do when you reach this far back! I can’t honestly say I’ve ever seen one of these in person – if anything, I’ve seen its pickup brother on the road, which has a similar front end with a pickup tail. While the build quality of Japanese cars was not up to the European or American competition, my understanding is that even the older cars scored pretty well with reliability. This little car, while probably not so powerful, would still be a fun and unique ride to run around town. As I’m catching up on all the little projects I’ve done over my brief ownership of my Lancia Beta, I realized I’ve got things a little out of order – I was having problems with the fuel pump, so decided to replace it. 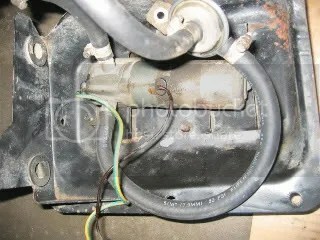 All the jiggling of the metal fuel lines agitated them and caused the leakage mentioned in a prior post. Anyway, on to the replacement of the pump – once I’d realized it needed occasional hitting to get it to run, and since it appeared to be the original pump, I decided to replace it with a modern pump to remove another possible point of failure. Based on recommendations, I got the Carter P60504 from Pep Boys – it’s easily available and more-or-less fits the original mounts, and at $51.99 including a pre-pump filter it fits the criteria of being a budget repair.